It can rightly be seen as something of a miracle that an enclave comparable in size to the U.S. state of Delaware could come out on the other side of war and political trauma to speak of an economy at all. While in Armenia analysts study the complexities of a “shadow economy”, for Nagorno Karabakh to even have a shadow of an economy is a mark of achievement. “ Black Garden” showed a 26 percent increase in agriculture output last year. Any objective overview of the state of development in Karabakh must put an asterisk behind every statistic – a reminder that it is hard to build a state while also trying to save it. It is worth remembering, too, that for much of its life since the Karabakh Movement began in 1988, survival has been enough. But, after 10 years of cease fire and well into a stable (if unrecognized) political life, economic life is breathing more freely. The breath of life for Karabakh remains its link to international aid agencies, to Diaspora and to Armenia. But as it depends on the outside for sustenance, there is plenty evidence that fierce efforts are being made toward self-reliance. Of 150 enterprises functioning in pre-war Karabakh, 135 are back – at least in presence, if not in production. 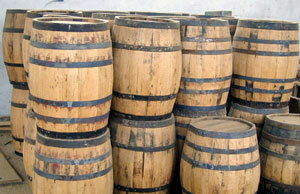 There are poultry and processed food plants at work, wine and vodka are being exported again. A wood factory builds outdoor furniture in Mardakert. Stepanakert has a diamond polishing company and there’s a bottling plant in Shushi producing water blessed by the archbishop. On a smaller scale, family businesses and restaurants line Stepanakert’s main boulevards, building dreams over the remains of missile-damaged real estate. One bomb shelter was turned into a disco and photo print shops are ready to record new images of an infrastructure on the rebound. On the lower end of Freedom Fighter Boulevard the same block holds one of many modern-styled petrol stations, a “Matrix” Internet café and, yes, a casino. 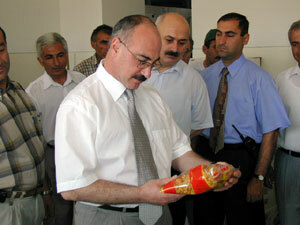 The President and the Prime Minister are among those proud of Karabakh's food processing plant. At least three new hotels have brought lodging in the capital into the 21 st century, yet none is more impressive than the eponymous-named hotel in Shushi, where something nearing 3-star luxury has risen among derelict and destroyed facades of war damage. A cellular telephone company is among the latest to bring outside investment, and even travel agencies have appeared in a place where, now, staying at home isn’t such a terrible thing. If they were a stubborn bunch of fighters, these Karabakhi Armenians, they also appear eager to make their reclaimed territory an incubator for foreign investment as well as home-grown opportunity. It is not by chance that economic recovery is coming to Karabakh. It is, rather, the effect of premeditated efforts by countrymen who see a link between viability and visibility. “Only an economically developed Nagorno Karabakh is able to strenuously defend its right to be recognized by the world community,” said President Arkady Ghukasian. Trends indicate that the de facto republic is earning a right to be recognized. This young decade has seen annual growth in Karabakh’s economy. In 2001, the volume of industry production grew by 121 percent over the previous year. Of course, even a little weight tips the balance of an empty scale, but the boom of industrial investment signaled in that year has been followed by subsequent, if more realistic, growth: 15 percent in 2002 and 38 percent last year. 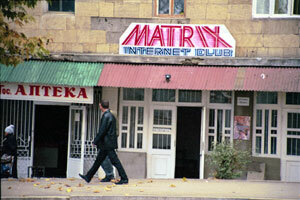 There’s no Keanu Reeves in Stepanakert, but there is a “Matrix” club. Industrial output was valued at $9.7 million in 2001 and is expected to be $19.5 million when the final reports are in for 2003. Karabakh’s very name means “black garden”, so given for its fertility. Agricultural output (though hampered by, among other things, arable land that cannot be tended because of landmines) shows hope of living up to the name. In the first 10 months of last year, farming production showed a 26 percent increase in cash value over 2002 (when the annual output was valued at $26.8 million). Overall, Karabakh essentially doubled its income between 2001-03 and if such growth rates are maintained expects to double again by the end of this year. Though still obstructed by vineyards littered with land mines, Karabakh wine has resumed production. 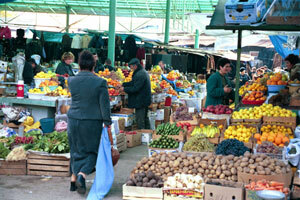 In 1999, income tax in Karabakh was 25 percent. It was lowered by five percent per year in consecutive years to its current rate of five percent. Land tax went from 15 percent to six percent. The result is a lesson in how to attract investment: Due in large part to tax breaks, allowances and incentives, the ratio of private enterprises functioning in Karabakh increased from 25 percent to 70 percent in the past three years. And if the President is looking for recognition via an “economically developed” Nagorno Karabakh, his government seems to be going in the right direction. The gross figures aren’t likely to turn heads at world economic forums. But for a country mostly unknown and almost entirely unrecognized by economic superpowers, it is significant that investors from at least 10 foreign countries have put $40 million into Karabakh over the past three years (ranging from $15 million for telecommunications to $1.5 million in the hotel business). Belgium , Monaco, Lebanon, Russia, Spain, Iran, United States, Switzerland, Australia, France have found reason to set up shop in “the disputed enclave”. And because Karabakh carries the “disputed” moniker (and of course political fact), it is excluded from many international programs that might accelerate its growth even beyond what it manages in its handicapped condition. Karabakh’s de facto status deprives it of participating in international economic projects aimed at economic development. It is not eligible for funds designated to Armenia by the World Bank, the United Nations or the International Monetary Fund. And, even though the US Agency for International Development allotted $35 million to Karabakh, the money can only be spent on humanitarian aid, not economic development. Put another asterisk, then, behind investment figures and imagine how many zeroes would follow the dollar sign, if Karabakh were “legitimate”. 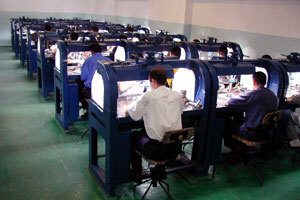 Diamond polishing is among industries putting a shine on the Karabakh economy. Alexanian says government leaders have examined the post-war strategies of different countries throughout the world, including Germany, Japan and the U.S.
“We concluded that no project can be implemented in the same way as another” he says. “When we adopted our program here, some economists said that the project was very brave, but we could feel that there was some distrust of it. Photos by Arthur Torosyan/ArmeniaNow.com and by DeFacto news agency.